The excellent paper of Moadel and colleagues  gives further support to the findings reported earlier by Meyer and colleagues  suggesting that 18F-FDG may be of benefit in treating hyper-metabolic neoplasms. For small breast tumors in five mice injected with 18F-FDG (2–4 mCi, i.p. ), Moadel and colleagues noted that 4% of tumor cells stained for an apoptotic marker 10 days afterward versus less than 1% of controls. For larger tumors in three older mice injected intra-peritoneally with 2 mCi of 18F-FDG, necrosis was found to comprise about 14% of the total tumor volume 10 days after the injection. However, as shown in the first known autoradiographic study of deoxyglucose uptake in breast cancer  (see Fig. 1), central necrotic areas could be identified which did not accumulate tracer and comprised approximately 12.5% of the estimated total tumor volume. As suggested by the detail seen in figure one, autoradiography of tracer doses of 18F-FDG in tissue sections would be an excellent way to test a response to radiotherapeutic doses of this tumor avid radiopharmaceutical, with the ability to simultaneously perform histochemical staining of apoptosis markers. 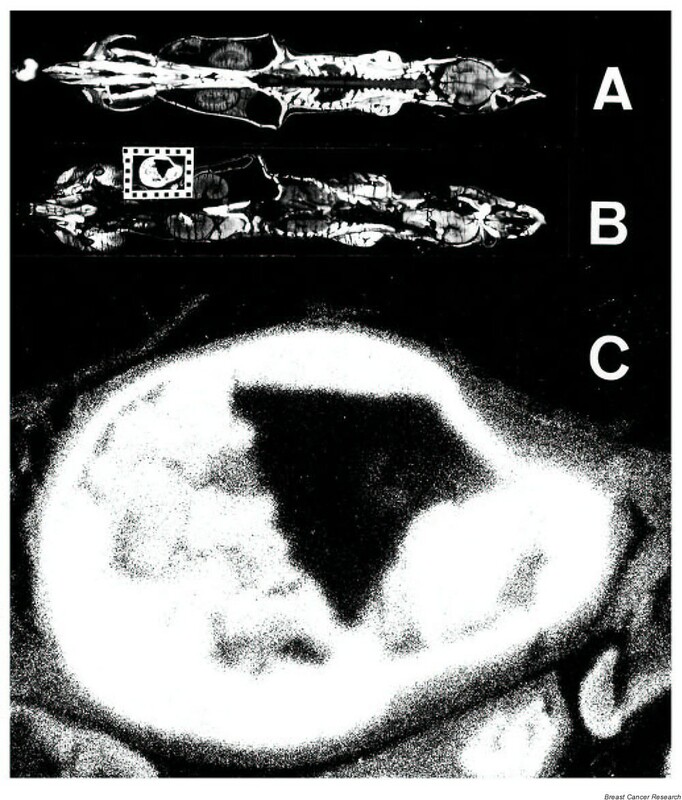 Whole body coronal autoradiograph of 14C-deoxyglucose uptake 45 min after tail vein injection in a control mouse (A), compared to that in a mouse with a transplanted breast adenocarcinoma (B). The elevated deoxyglucose uptake within the tumor (B, rectangle), is shown in more detail in the 12-fold enlargement seen in (C), which displays a prominent lack of uptake within a central necrotic cavity. In regards to the mean standardized uptake value (SUV) of 6.74 for the five breast tumors analyzed by the authors using positron emission tomography (PET), this agrees well with the mean SUV of 6.52 noted in a meta-analysis of 159 breast cancer cases . However, in regards to the use of this data for dosimetry, the authors should consider that positrons have a higher than expected relative biologic effect, with S values that increase with smaller tumor size . More research is clearly needed on the potential use of 18F-FDG in treating breast cancer. In the same way that PET imaging of tracer doses of 18F-FDG is very useful in identifying occult breast cancer , it may prove to be of benefit in a direct radiotherapeutic approach.